I got friends with tractors, y'know. But I ain't never seen one like this. If you're a tractor fan you may have a hard time placing this make and model. Closest I could find was a Case International 955... with a paint job, modded exhaust and open cab design. Not sure what that's about. This was a TLG S@H promo way back in fall. Maybe it was released to celebrate fall tillage? I'm still unclear on the whole thing. From the pictures that were leaked at the beginning of 2015 I got all excited about more mini tractors. Building was sort of a joy but 51 pieces really goes fast. Not only do you get a tractor but like the picture promises, a tiller. Most of the time I would expect a tiller (or any attachment) to have a 3-point hookup so that it could follow the tractor when it turns. 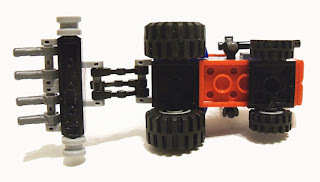 This (like so many other failed connections) is built with simple droid arms allowing up and down. Sure, these attachments will go up and down but that's not all. Is it? Have I been disillusioned this whole time? As usual my build includes the extra pieces in a few places to enhance it from the original. 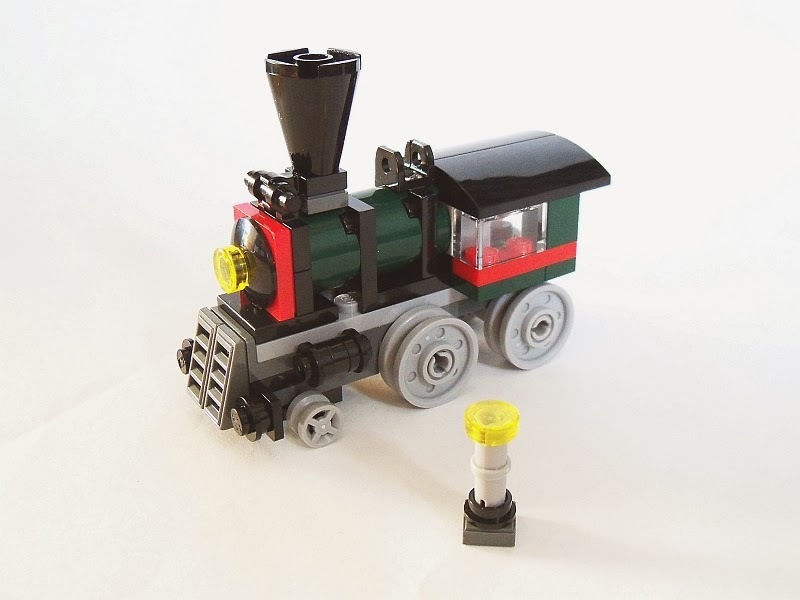 It's too late to get the promo from TLG but you could get one on Bricklink. They're barely above $3 and available for almost down to $2. 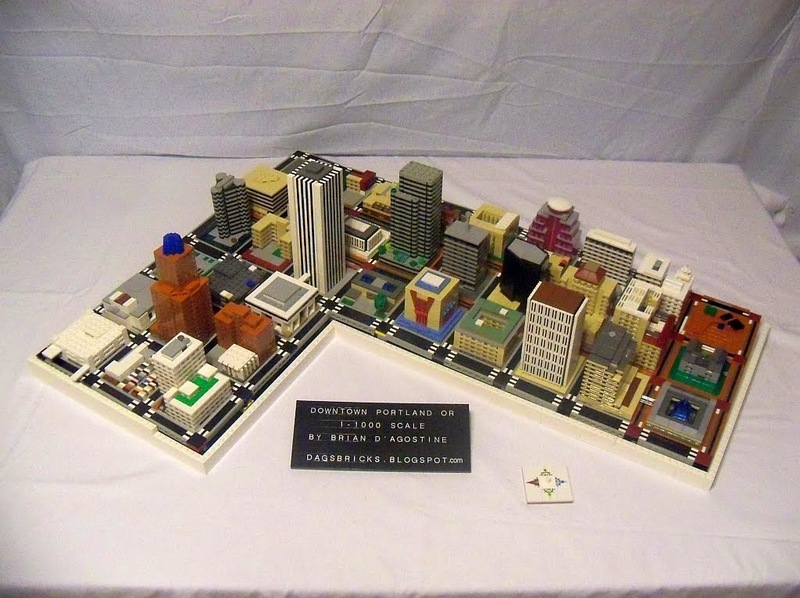 You might even be able to build it with pieces from your collection. Nothing fancy here. Hey, there's a contest going on! One of those classic "guess the pieces" but you don't get the pieces. I'll give you something else cool though if you win. Yeah, this was last year's set. But I found a few at TRU and have a soft spot for the polybags so I grabbed it anyway. I didn't do much research into it beforehand but was thinking maybe I'd finally get some of the newer ball and cup connectors. 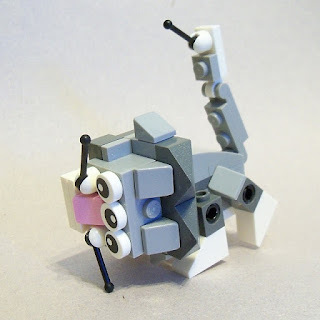 Unlike a real cat's head, this one can only rotate side to side. As you know, a real cat can turn their head in at least 5 dimensions including inside out. If you like cats, you'll love this little set. If you don't then just imagine that it's a manifestation of Groucho Marx in felinoid form. The two levers used for whiskers don't quite translate and look more like a mustache. Them big eyes are a dead ringer for a set of coke bottles. Overall the sculpting is reasonable but what can you do with 54 pieces? I guess my biggest complaint (other than the lacking ball and cup joints) would be the unfinished look at the tops of the legs. An extra little cheese slope on top of them all would go a long way towards completing the look. I dunno, I think there could be an overall improvement on this set. But what they hey it's a good value for pieces. My rebuilding posts seem to be growing in popularity. It's one of the few series where I am actively getting requests. At Bricks Cascade this last weekend, Ben asked me if I could analyze the Green Grocer. It's one of the sets he missed out on but the aftermarket prices are a little steep. Not nearly as bad as, say, the Millenium Falcon, but still around $1000. 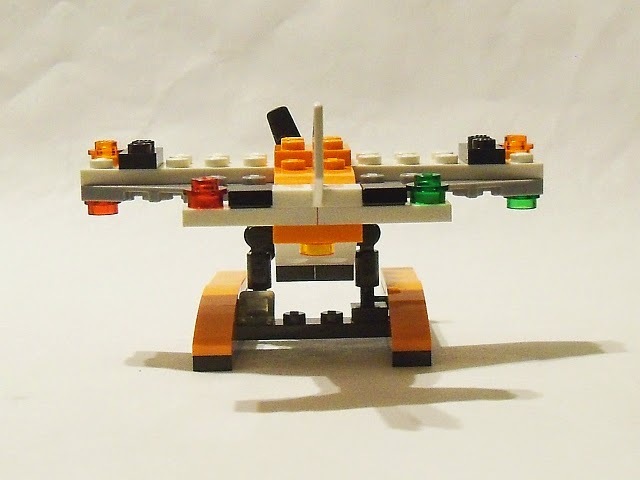 If you still aren't familiar with using BrickStock, hit up the Falcon post (link above) to see a brief tutorial at the beginning of that article. For the rest of you, let's dive in! Open up BrickStock and load in the Green Grocer. Get the value of the parts (Ctrl-A, Ctrl-G), then get the most expensive to the top (click, click). Notice that the parts value is already at $758, roughly a quarter less than purchasing one. Maybe we could have something here. The panel can be changed to the new variant with side supports. However, this will slightly change the look of the Palladian window on the third floor. Two of the original panels cost over $17. Two of the new variants will be $0.13. The next spendy item is the 1x2x3 train window. I don't even know the point of using the train style. The features of it are turned to the inside and no glass is used. My assumption is that the flat front 1x2x3 window was not produced until after this set was designed. In that case, change the train window to a 60593 and save about $32 on all four pieces. Per my previous posts, you might know that I strike the figs from these sets. If you are recreating for resale, then you'll want them in. If this is a display piece, you'll either not care what the figs look like or you may not use them. $26 saved if you choose not to use them. If you're cutting the figs, you could cut the cat too at $2.75. As with the Cafe Corner, two 16x32 baseplates are unnecessary. The model is not built to split open. Replace them with a single $8 32x32 baseplate. Change the number to 3811, quantity to 1 and physically change the price to $8. Next click the black door then sort by description. You'll notice that there are both variants of doors for all three colors. The Type 1 door is the older style and is more expensive. Obviously. Highlight all three of those variants and note that the price is around $32. Now highlight the Type 2 variants. A grand total of $4. Strike the Type 1 doors. Note that this only catches 3 variants. Click the "Status" column to find the others. Scroll all the way down. Whenever you see doubles, strike the most expensive one. In most cases it will make little difference but it will clean up your end result. Note that all the extras are just above this. The original set came with 54 extras totaling under $4. Might as well remove them all. Now go back to the top and sort by the "Total" column. You'll notice right away that Sand Green bricks top the list. It's hard to replace a basic brick, but what if we could replace a color? Crazy? Select the 1x8 brick and click the "Color" column. We only have 6 unique pieces to try to replace. Highlight them all and let's have fun. Total value of all 243 parts is $316. My first thought is to try the newer Olive Green. It's a bit yellower, and I don't think we'll have good luck with the hinge base or slotted bricks, but let's try. Sure enough, those two parts don't exist in Olive. The hinge base is easy though. Two of them are hidden by the outdoor vegetable display. Five others are hidden within the roof. Change the color to anything else. Black would work and takes $1.20 off the price EACH. That's $8 of savings. The slotted brick is going to be a little challenge. It's used for architectural appeal in several places. You could possibly change it to Light Bley/Medium Stone. The total price drops from $111 to $13. Or change them to plain 1x2 Olive Green bricks and drop the price to $10. If you want to see some architectural variety, you can replace them all with triple the number of 1x2 plates. That would be $18 for the lot. If it was me I'd be inclined to go the plain brick route, then hope that TLG made some Olive Green slotted bricks in the future. Or, change the style up a bit and replace every single Sand Green brick with a bunch of brick bricks. It doesn't change the price much per stud, but it would have a WAY different look with pieces that would be much easier to source. For the remainder of the bricks, Olive Green drops the price from $180 to $48. Click the "Total" column again to get the spendy items up top.The Dark Red inverted slopes are $3 each. As much as I love the color, it is obscured slightly by the window glass in front of them. Maybe we could change them to Reddish Brown? That also requires changing 8 of the 12 1x1 bricks as well. 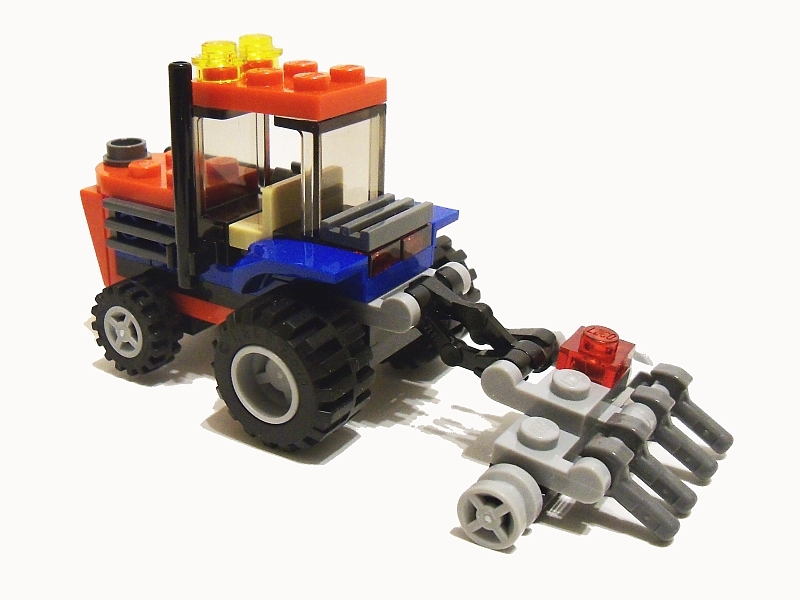 Highlight the inverted slopes, sort by color, then select the 1x1 Dark Red bricks. Ctrl-C, Ctrl-V to create a second lot. Answer "No" to both pop-ups. Your new lot will be at the bottom. Change the color to Reddish Brown and the quantity to 8. Go back up to the Dark Red colors and change that 1x1 brick lot to quantity 4. Then change the color of the inverted slope to Reddish Brown. Ctrl-G that item. A change to Dark Purple would net the same savings. The Light Bley/Medium Stone 1x8 bricks are expensive. It would not be completely unreasonable to replace them with twice the quantity of 1x4 bricks. Change the part# to 3010 and the quantity to 58. This drops the price from $11 to $7. The Tan 1x6 arch is rather expensive and can be replaced with a newer and subtle variant. Change the part# to 92950 and watch $8 melt away. Changing the lamp post to part# 11062 drops $1. Select all and Ctrl-G to get the price at this point. I see $358. That's amazing! We've cut the price by well over half! Don't forget that this is the Olive Green version, at least mine is. If you've kept the Sand Green, You'll be a little over $600. There's not much more to consider at this point that would make a big difference. Maybe changing from new to used pieces. Maybe some minor details of replacing longer bricks or plates with shorter ones. Or replacing the 2x16 plates with any other available color. Bear in mind that you have some complicated ceiling assemblies to build. Don't cut the plates down too small or you'll have structural failure. Double check the instructions to be sure. You can now export to your Wanted List on either Bricklink or BrickOwl. I suppose you could say that there are an infinite number of building sets available to be created. If you consider a valid set to start at 5 pieces, you could select from the entirety of, say, 50,000 unique pieces (not counting printed parts or minor variations) and get 3.125e+23 different sets. That's like 31 sextillion (or trilliard, depending on your scale) different sets. Of course, some of them would be barely indistinguishable from each other. Oh, and we didn't include color choices in that number. For something more like 67 pieces it becomes a number with a 10^314 after it. Granted, most of those sets would be chaff but you'd think there could be some unique variety. 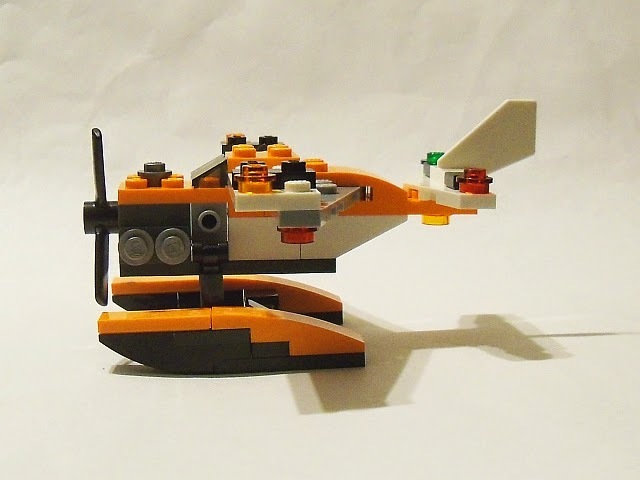 And yet, upon purchasing this set, the first thing I thought of was the 31000 Mini Speeder. As with that set, I could have built in the bag but two reasons kept me from doing so. First, I was interested in seeing two of the builds. Second, I am writing this article about an hour before bed time on the night before it's scheduled. I tried to find time for the boy and I to build it but other events crowded in. I built the Mario Kart first. 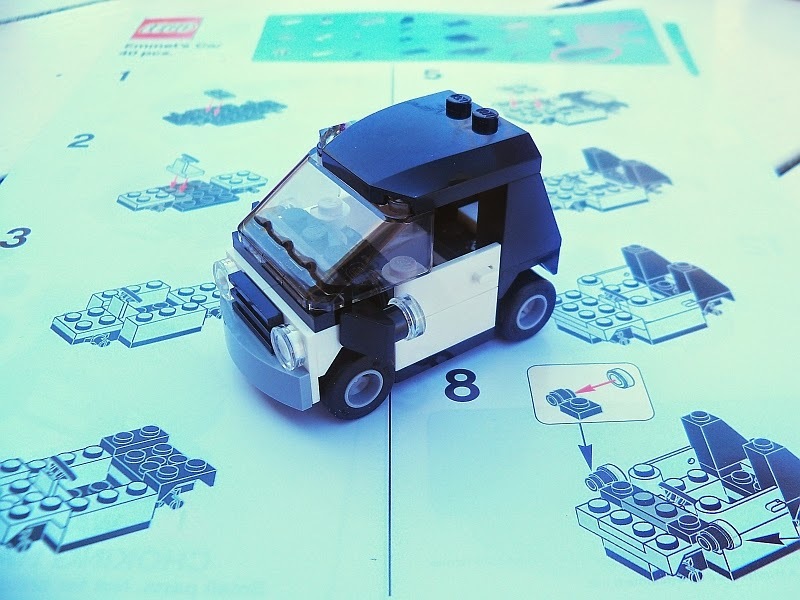 It only uses 33 pieces but is a fabulously cute little build. The only improvement might me a little skirting on the side. Fenders probably shoulda waited for a few steps. As I was building the main model, it occurred to me that each step did not note the pieces that I would need next. It just expected me to compare the current picture to the previous picture and figure it out myself. This was in stark contrast to the recent build I did of 31012 Family House. 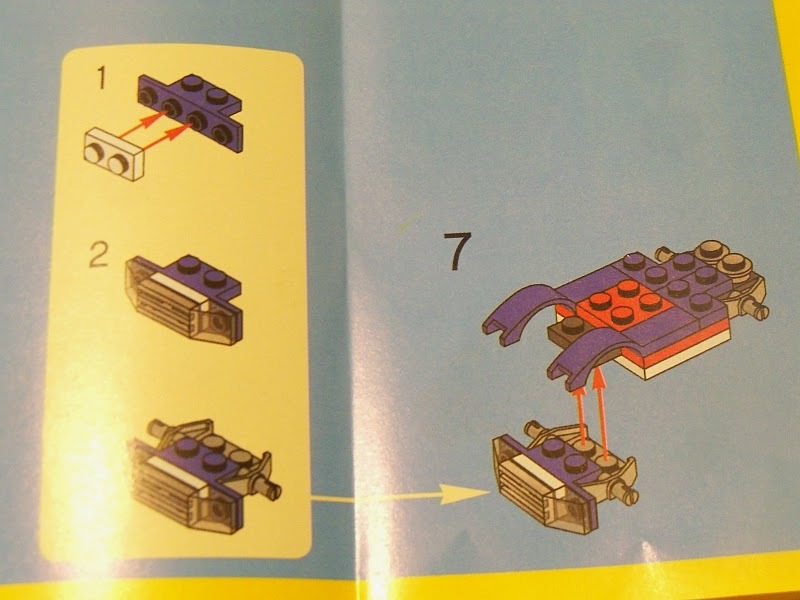 Those (and many other instructions) showed me both pieces I would need for each step as well as the picture to show where they went. I could call this an error on the Blue Racer instructions and I might be right. I found an incorrect image and an unusual discontinuity as well. It's almost like they outsourced these instructions to Samsonite. You wanted a plow on the snowplow? Yeah, that'll be extra. The coolest part about the main build is the rear hood that lifts up to reveal the engine. 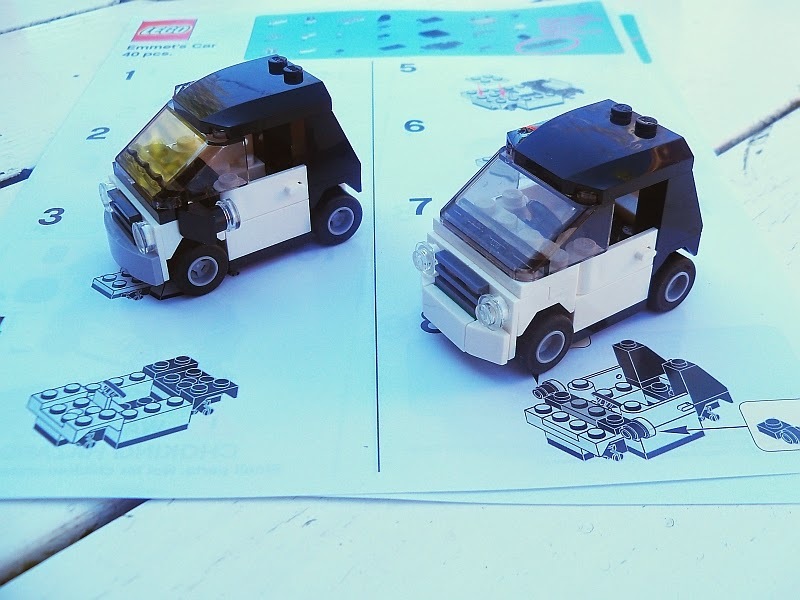 Given that there are a few extra parts (or the fact that this is a LEGO model, doggonit) you could change up the parts under the hood ever so slightly. Welcome aboard, 2015 sets! This marks the first review of the new offerings. Thankfully I've got a queue a mile long which should take me at least past Bricks Cascade 2015. 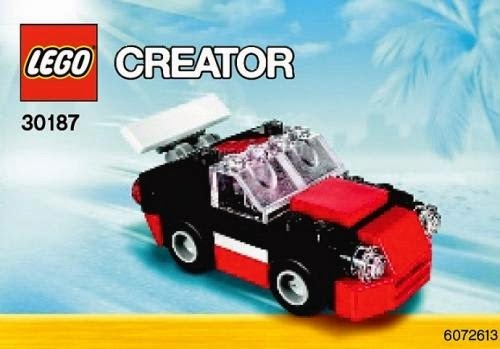 We'll start off with the new Creator mini sets. Last year TLG released three tiny box sets; Red Thunder, Power Digger, and Emerald Express. I'm not sure if we need to expect a third box set in June or if this is it for the year. Sorry Creator, your division is taking a 33% cut. 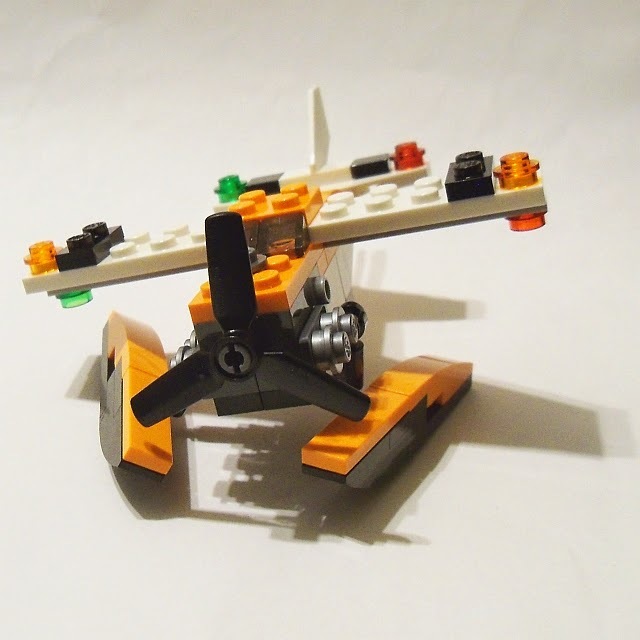 The box and instructions show that you can also build a personal hydroplane and a sailboat. The hydroplane is OK, the sailboat (or catamaran, I suppose) is very clever. 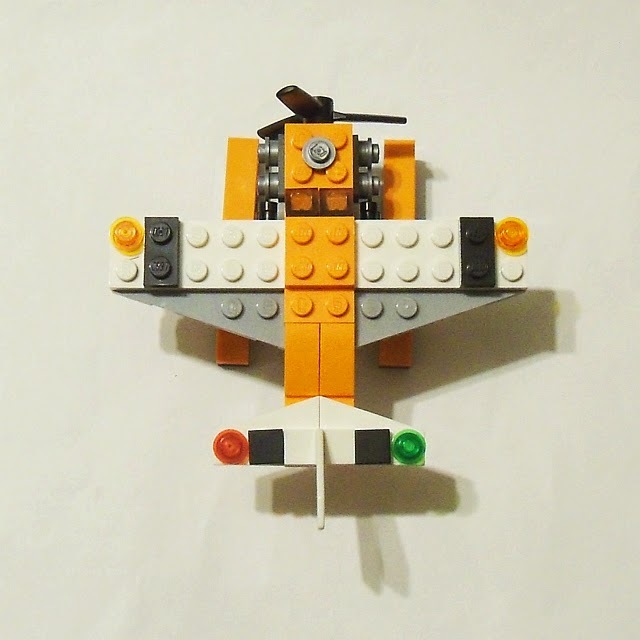 I didn't bother to build either of those models, but I did attempt a helicopter. It seems so common for airplanes and helicopters to interchange their parts with each other that I wondered why TLG designers didn't give it a try. Then I tried attaching overhead rotors and realized that maybe they had tried. Dud. This sea plane makes use of some of the newer elements and one brand new one. Tim over at New Elementary covered the 1x2 plate with opposing handles last month. There are also some inverted curved slopes and baby bows. The new handled plate is used to attach the pontoon assembly in a rather unique way. Were it not for a 1x6 cross member between the two pontoons, this connection would remind me of Goofy on skis. Maybe someone got excited about using new parts (not something that the Creator division can commission) and was tired of completely brick built solutions. Whatever the reason, it's an unexpected but pleasant little connection. The whole build is much stubbier than the box art would lead me to believe. Maybe the Creator division wanted to get in on some Chibi? Oh wait, they tried that last year with some non splendid results. Okay, not sure what the deal is but two of these stacked on top of each other would just about fit into a perfect cube. 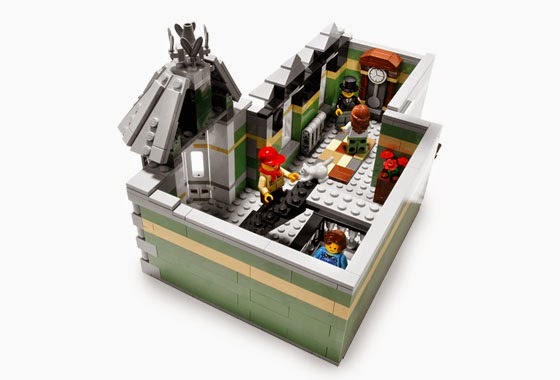 Click the pictures below to get creative at LEGO Shop@Home! 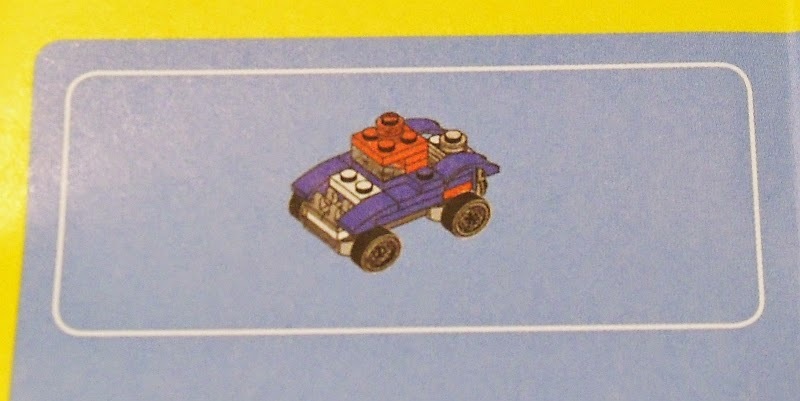 If you haven't heard by now, Toys'R'Spendy had an in store model build with Emmet's Car. Twice. I guess the first event was seriously lacking in folks? Anywho, I'm probably the last blogger in the interwebs to be throwing this out there. But fellow lugger DMChylde was kind enough to get an extra for me to review. Flash back a few years to 2010. My dark ages were lightening up and I discovered the Small Car. This was a BRILLIANT design and so indicative of the new small cars that were starting to show up on US shores. I had to buy one. It's still one of my favorite sets. Of course, I like small stuff. 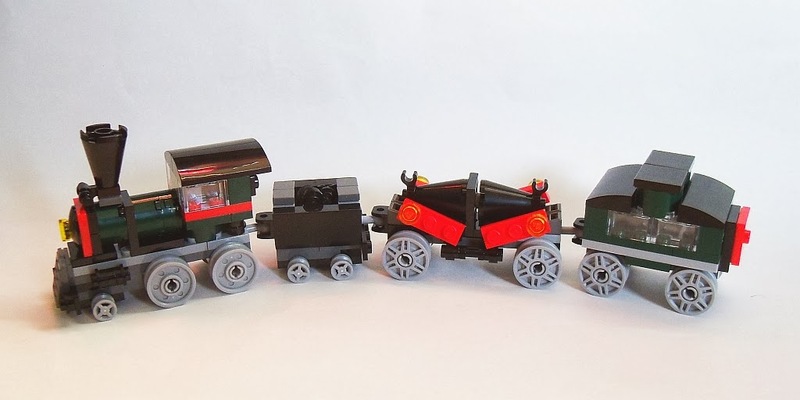 Also that year (though unnoticed by me until later) was the Cargo Train which contained two of those cars, rehashed. 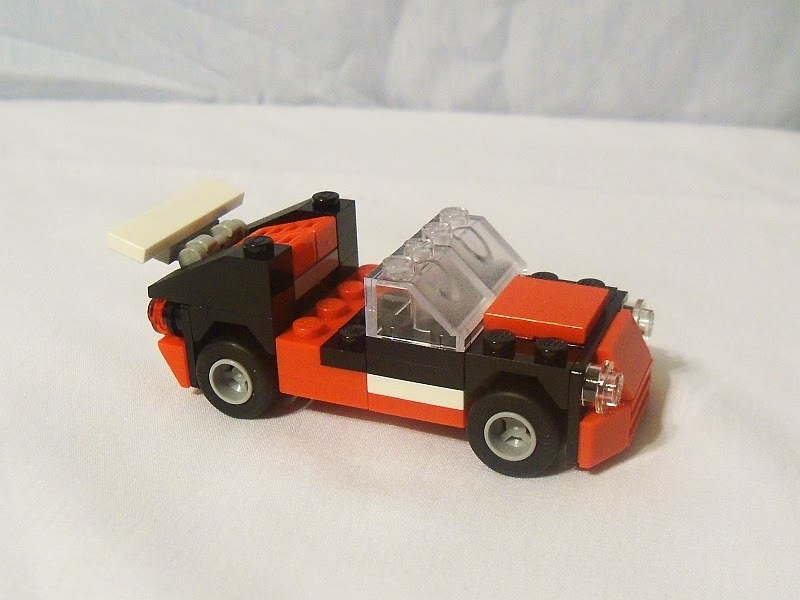 So when I saw Emmet's Car in the LEGO Movie, I probably squealed like a little girl. Thankfully there were only 6 of us in the theatre and I knew none of them. It was the Small Car, updated with a few new parts. This is the set that TRU chose to use for their build event. 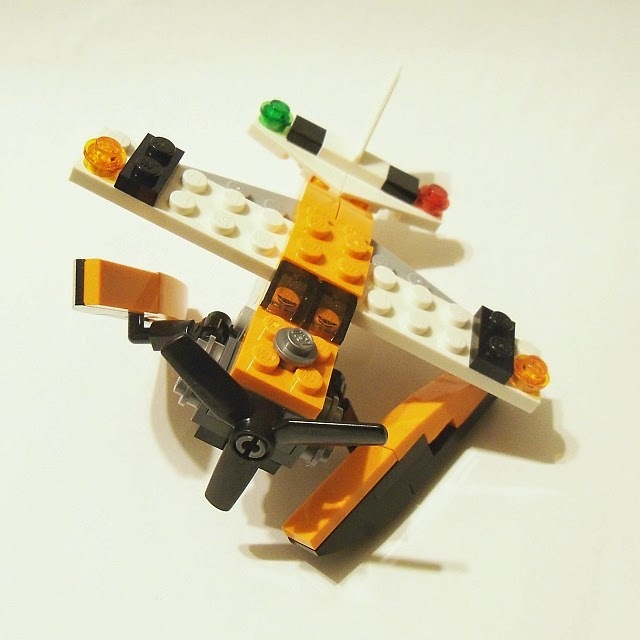 The idea is that, much like other LEGO Movie sets, you could build two different tiny things with the same (mostly) pieces. 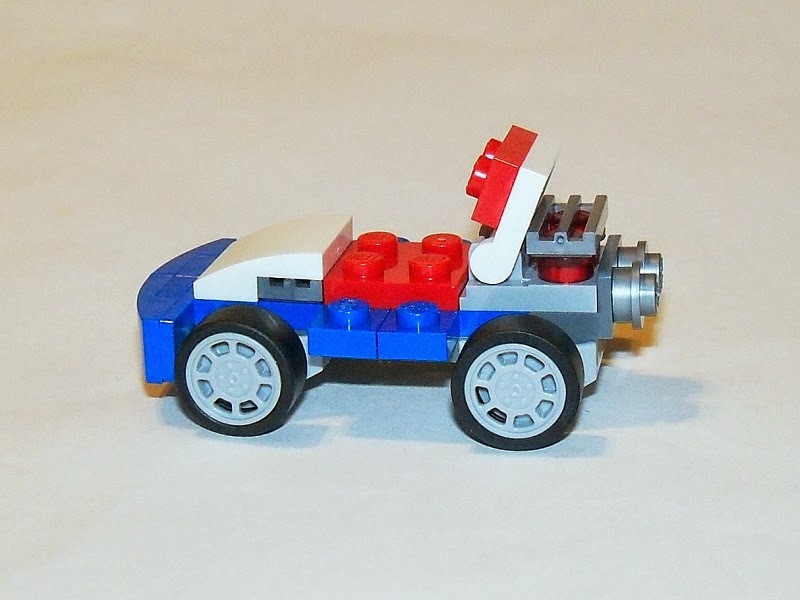 First is Emmet's Car which is the Small Car with a better bumper design, color matched steering wheel, and rear view mirrors. Second, you build a flying car which I don't remember seeing in the movie. Maybe it was there or maybe it was too long ago since I saw it. It's a decent build but it looks like it was built from another set. I suppose TLG could have Creator-fied the car and made it a little more versatile. But with that Creator concept also comes the risk of flimsy. 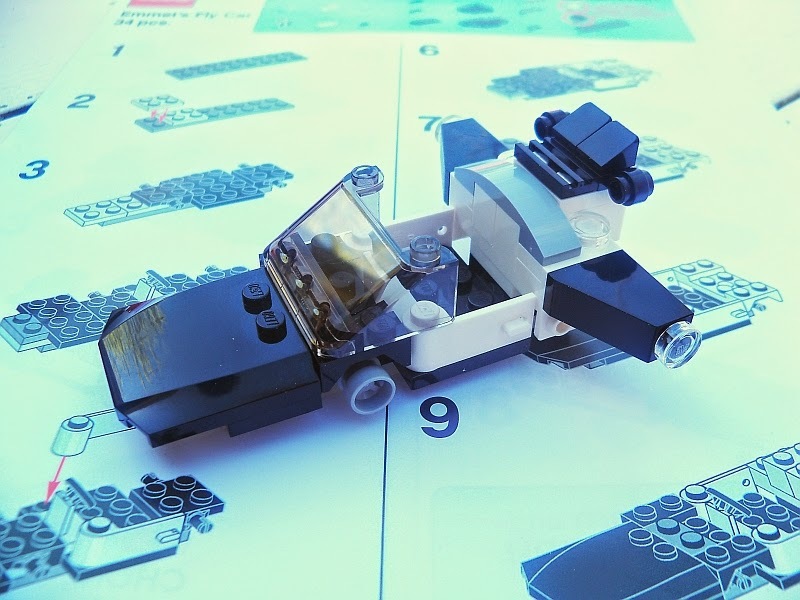 Nonetheless it was a fun Sunday afternoon diversion to build the car, then the flying car, then the car again (since I like that build better). Um, and no, I didn't try to build something else. Sorry, I just ignored that whole creativity thing. So this is what set names have devolved to. 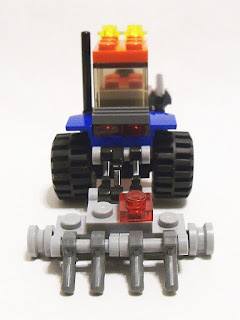 Remember the days of Tiny Turbos when TLG had an endless wheel to spin and came up with names like Chrome Ripper and Mud Slinger and Track Captain? Now we get (wait for it) Fast... Car... Um yes. 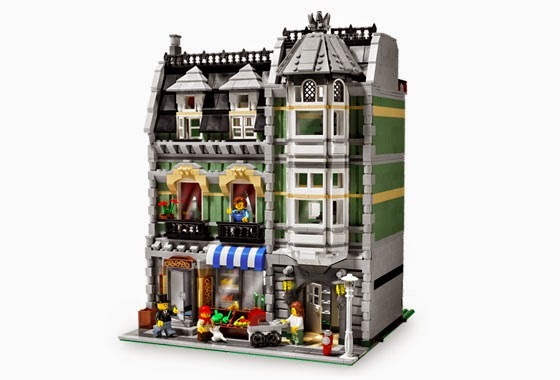 And the next Modular will be named, Big Building? It's like they're not even trying anymore. For $3.29 in the seasonal aisle of Target you can get 56 pieces + 5 extras. That's a great per part value of like 5c! 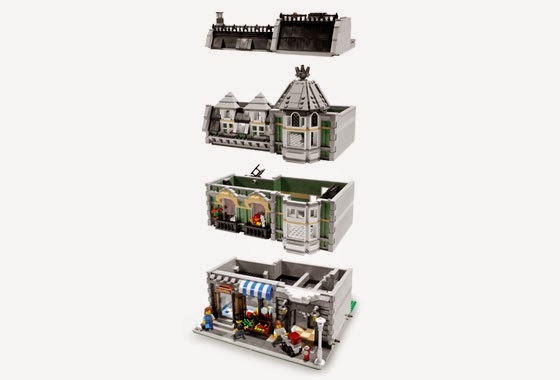 Granted there's nothing special in here and most of those parts sell in the penny to nickel range on BrickOwl and Bricklink. 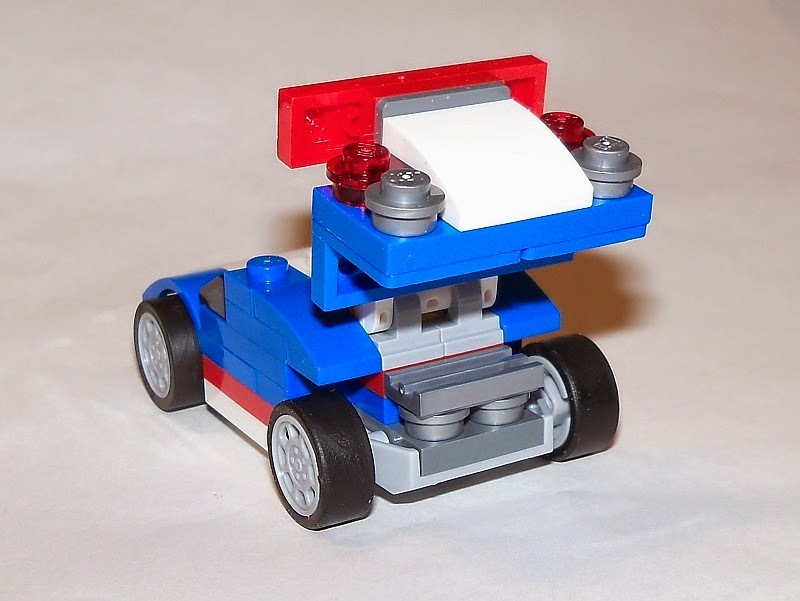 Unlike other Creator sets, there's little to nothing in the way if something like two 1x2 plates were a 2x2 would work. So the piece count could have been inflated a touch. 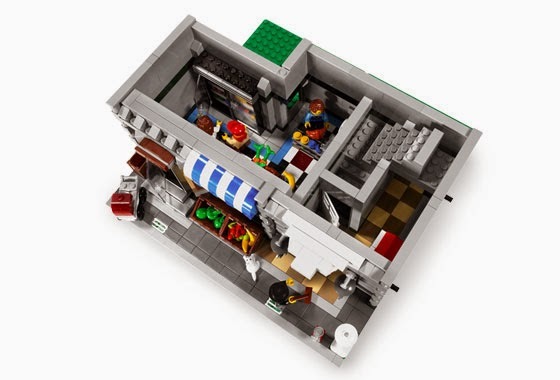 Way more better and you could even sit a minifig in it for mis-scaled laughs. For a parts pack, yeah, go for it, pick a bunch of these up. Cheap wheels and plates. But for display, unless you like disproportionate stubby things, might as well pass. This is the final set in a series of three reviews covering the smallest Creator sets for the first quarter of 2014. The first was a helicopter wherein I described much of the confusion involved (not all mine) in obtaining these sets. The second was a three-fer where I got my kids involved. This week we've got one more three-fer but we take to the rails. Alone. Yeah, I stiffed the kids. This set was the hardest to get. Apparently everyone loves trains. I'm good with trains. Anything that can kill you should rightfully be respected. Very few things can do it with awe though. Kill and respect, that is. 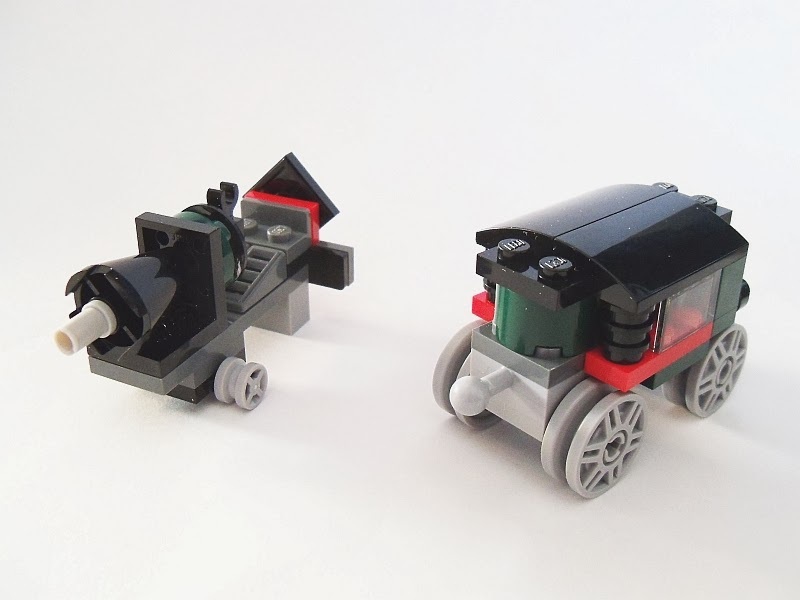 The Emerald Express (not to be confused with the Emerald Night) is a small train that evokes its confusing namesake if it were about 100 years older. The first thing that caught my eye was the dark green. This is the first set to offer us dark green 2x2 round bricks and one of only a few to offer us the 2x2 round plate in the same color. But I think that's just icing on the cake. The reason this set is so hard to get is because everyone seems to want three copies. How else can you build the train that they insinuate with the packaging diagram? You can't! So I bought three and I built three. For as much as I appreciate trains though, I was a little disappointed. For starters, the main locomotive has something about it that isn't quite right. It struck me that it looks as if Monster Garage got a hold of it. The cab is a bit low. And by a bit I mean a lot. This is like the low rider of trains. Or maybe an idea of what a low rider monster truck might look like. Other than that it's rather evocative of the classic era of the rails. Cow catcher, smokestack, and some sort of piston looking things up front. The extra parts get you some sort of track side signal. 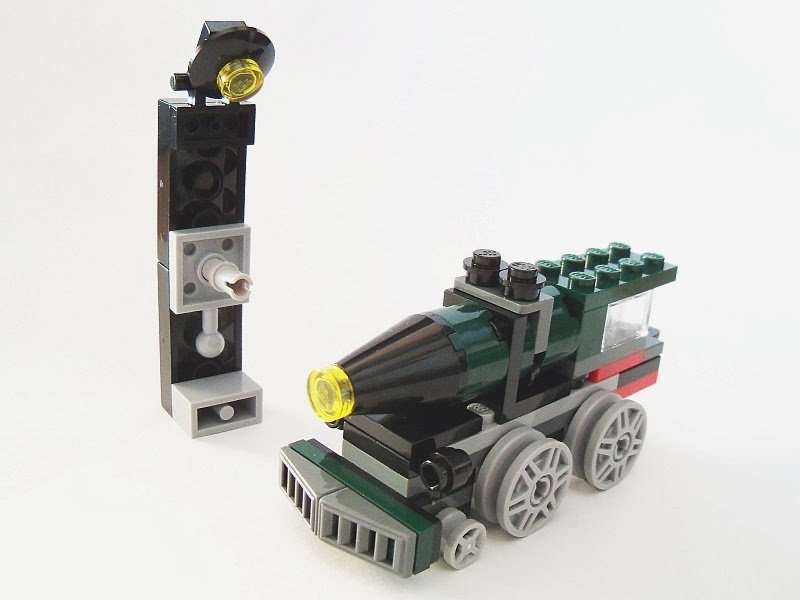 The second train you get to build is some sort of vaguely steampunkish rocket train. I say steampunkish only because the Victorian vibe is still there. This looks sort of like what Jules Verne may have written about were he a train head. It's a touch silly but still sort of okay looking. It certainly looks fast, even while standing still. It can probably achieve 88mph if you need it to. With the extra parts I put together some sort of larger track side signal. The third car is some sort of carriage that looks like a stage coach sans horsies. But it rides on rails. Like some sort of early trolley. It takes advantage of very few of the pieces and overall has an air of "We had to have three things, sorry" to it. If you have an imagination then it can certainly look the part but personally I wish something in the 8-long category could have been effected a little better. there were several leftover parts that just wanted to help give it an upgrade. Instead I used them to build some sort of Civil war era mobile field cannon thingy. Trust me, you don't want to be standing near the wheels end when that thing goes off. So then I thought to myself, if models two and three offer so much disappointment, couldn't I do better? Maybe. I noted that while there were three pieces to be built, there were really three connections. Since all the trains have 3 sets of wheels, I could probably squeeze out another car and get 4 total pieces of rolling stock. Would the remainder of the pieces let me do that though? I left the original locomotive alone. I did boost the cab by a brick in height so it looked more proportional to itself. And as you know, any self respecting locomotive needs a tender behind it. 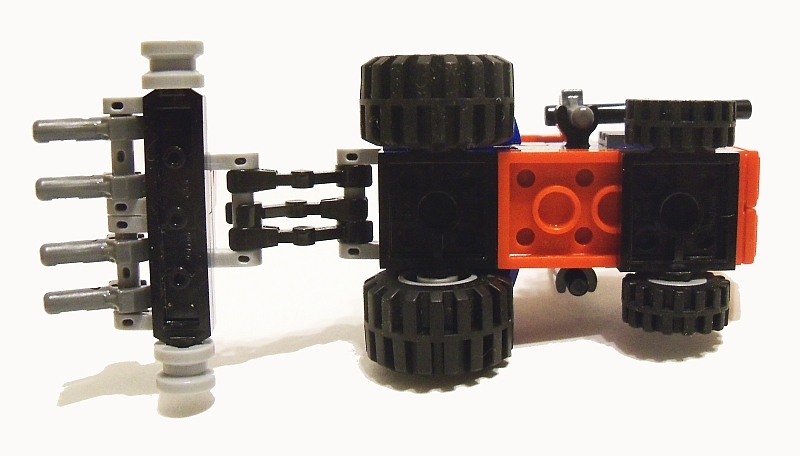 So the tiny wheels made that happen as well as the proliferation of 1x1 black round plates. It's a coal tender. At first I thought I'd like to have a passenger coach and a caboose. But that dream was quickly dashed and I had to combine the two ideas into one. With what little was left I tried to figure out what to do for the fourth car. It ended up as a flatbed carrying something that resembles either a calliope or a nuclear missile, Victorian style. I'm still undecided. In the end I'm pleased. I only left 8 pieces out of the entire train. Since each set comes with 3 extras I'm mathematically ahead by one piece. So I got that going for me. A single set is $5 and includes 56 pieces plus those three extras. This lands somewhere in the 8c per piece price range. It also comes with wheels (and no tires) and a wide assortment of functional pieces. It's a little bit of a mess to me and probably a borderline joke if you're into real 9V and RC trains. But as a desk model the main build is reasonable. I'd love to see what sort of improvements you've come up with. Give us a link in the comments below.